Things go better with butter. Even lettuce (trust us). This dish is perfect for entertaining. Because the flavor and texture are sensational – and it’s a real conversation starter. You can use any type of lettuce you like in this salad. But it’s best when made with one of the leafy butterhead varieties (that is, butter, Bibb, or Boston Bibb). There are subtle differences among these various butterheads, but they can be used interchangeably. The type you’re most likely to see in markets is Boston Bibb, so that’s what we’re using. We first saw this recipe years ago in the late, lamented Gourmet magazine. We forgot about it until recently, when we spotted the recipe while browsing through The Gourmet Cookbook (the big yellow volume edited by Ruth Reichl). We were excited to rediscover the dish, and it has become a frequent visitor to our table. This recipe takes about 10 to 15 minutes for prep and assembly. It makes 4 first-course servings. Separate the lettuce leaves. Then wash, dry, and chill them. 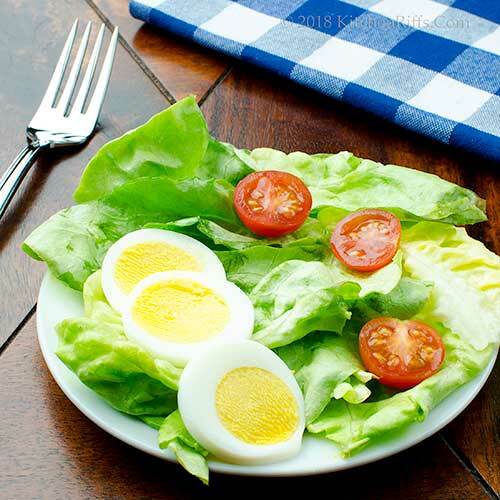 An hour before serving, remove the lettuce from the refrigerator and let it sit at room temperature (the lettuce can’t be cold when you make this salad; if it is, the butter will congeal on the leaves – very unappetizing). 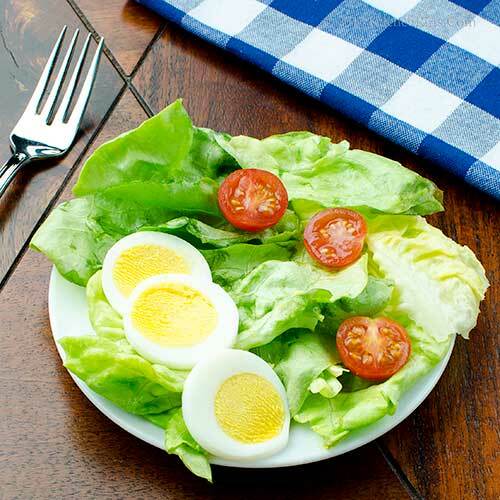 When you’re ready to make the salad, place the lettuce leaves in a heat-proof bowl. Melt the butter in a small saucepan. Peel the garlic clove (if using), cut it in half, and add it to the butter. Simmer the garlic clove in the butter for 3 minutes. Remove the garlic clove and discard it. Add the lemon juice. Add salt and pepper to taste. Whisk for a minute to combine – the mixture should be light and frothy. Add the butter mixture to the lettuce, then toss to combine. Divide the lettuce among individual serving plates. Garnish, if you wish, and serve. Boston Bibb usually features larger heads than other varieties of butterhead lettuce. So one large head of Boston Bibb might equal two to four heads of another variety. Go by weight and be prepared to adjust quantities. With that said, exact quantiles aren’t critical with this recipe. Butter and lemon provide much of the flavor in this dish. So use high-quality butter. You might want to consider buying one of those “European” style butters. Make sure to use fresh lemon juice – its flavor is much better than bottled, or even frozen. Speaking of lemon juice, feel free to adjust the quantity to taste. We use kosher salt for cooking. It’s less salty by volume than regular table salt (the flakes are larger, so it doesn’t pack a measure as tightly). If using regular table salt, start with about half as much as we suggest. But always season to your taste, not ours. You can serve this salad without garnish, but we usually add it. 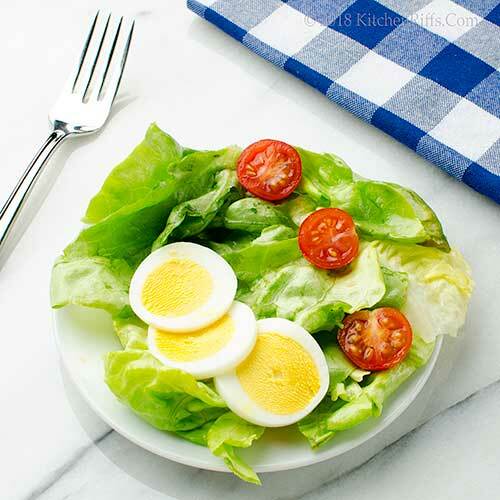 We like to use slices of hard-boiled egg and cherry tomatoes. Slices of prosciutto or ham are also terrific in this salad. Croutons would work nicely, too. “You’re going through that salad like a hot knife through butter,” I said. Mrs K R. Butter wouldn’t melt in her mouth. This sound pretty good. I will have to try it one day before too long. We also cut romaine lettuce in half, coat the cut half with olive oil and plop it on the grill for a couple of minutes. The cut edge chars and with a little blue cheese, salt, pepper, oil and vinegar it is really tasty. Butter is pretty much my life but I've never added it to a salad before. Clearly I've been missing out! I need to try this one ASAP! This recipe got my attention. I would have never thought to put hot butter on salads. I am making it tonight with my leftover vegetable soup. Hi Anne, romaine is wonderful to grill! Love it. :-) Thanks for the comment. Hi Kelsie, you really do need to try this! Really good -- you'll like. :-) Thanks for the comment. Hi Gerlilnde, it's a neat salad! I thought the butter was odd the first time I saw this, too, but it works extremely well. Thanks for the comment. What an interesting salad, loving the use of butter. I also love to cook the garlic so that it isn’t overwhelming, otherwise it can ruin a salad. Boston Bibb is on of my favourite lettuces. I read Anne in the kitchen’s comment, we love to grill romaine oe wven iceberg lettuce, sooooo good! Hi Eva, this is a fun dish -- and incredibly tasty. Make it once, you'll make it often. And I've had grilled romaine on my "to blog" list for years now -- maybe next summer I'll finally get around to it. :-) Thanks for the comment. Buttered salad? I neveer heard of such a thing. Nor have I ever heard specifically about butterhead lettuce. What a lettuce expert you are. I am SUPER intrigued by this recipe, will try it. This sounds like a delicious idea and I've not tried anything similar before so I'll need to give this a try! Simple and delicious...butter and eggs...way to go! Hi Evelyne, you HAVE to try this! SO GOOD! :-) Thanks for the comment. Hi Caroline, this is pretty unusual -- and so worth trying. And then serving to your friends -- they'll be amazed. :-) Thanks for the comment. Hi Angie, yup, butter and eggs. :-) Thanks for the comment. Simple and delicious - perfect! Hi Pam, yup. :-) Thanks for the comment. 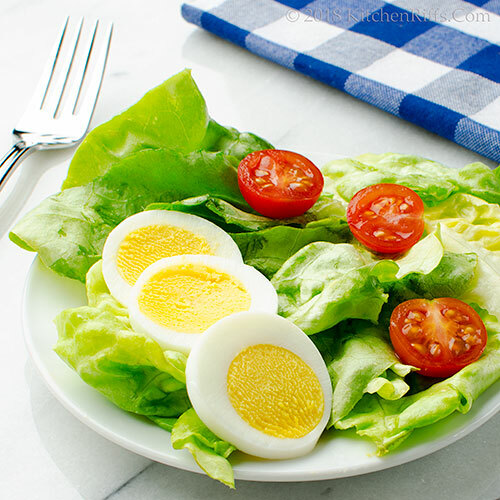 Hi Tricia, hard-boiled eggs always look great, don't they? Terrific garnish on a salad like this! Thanks for the comment. I love this and have to try it. It reminds me a bit of a hot bacon dressing so heck, why not hot butter!? YUM! Hi Dahn, same concept as hot bacon dressing, although obviously a different fat. It's good! Thanks for the comment. This is fascinating! You always share the most interesting recipes. Never thought butter and lettuce would go together, but now I have to try it! Hi Laura, bet you'll love this. :-) Thanks for the comment. This would be perfect to serve my dinner club! Definitely a conversation starter!! Hi Liz, they'll talk about this one! In a good way, of course. :-) Thanks for the comment. I've heard about this salad recipe, but never thought to actually try it. Now I know it's a winner I'll give it a try. Hi Deb, I think you'll like this -- really tasty and unusual. :-) Thanks for the comment. Hi Sherry, melted is perfect! Try it, you'll like it. :-) Thanks for the comment. Butter makes it better, end of story. Still, it is a brilliant idea to get enough garlic flavour in the butter without overpowering it and this would definitely melt in your mouth. This is so interesting, I have to give it a try. And isn't butter lettuce just the best? Now this would be a win win recipe for all the keto dieters out there. Vegetables, eggs and grass fed butter. You gotta love that! Low carb and lovely. Hi Merryn, butter definitely does make things better. :-) Thanks for the comment. Hi Lea Ann, butter lettuce is terrific! Good flavor, love the texture and shape of its leaves. Thanks for the comment. Hi Bobbi, I hadn't thought of this in terms of a keto diet, but you're right! :-) Thanks for the comment. Well, this isn't much different than olive oil coating lettuce leaves, so I get it! Can't wait to try! Hi Mimi, definitely different. :-) And definitely delish! Thanks for the comment. Why can't I print this? Wow! How did this one get past me? I've never heard of it. Can't wait to try it! Hi Unknown, because we don't have a recipe plug-in for printing! Because we haven't found one that we like that works on our blogging software. And because the Notes are an important part of our recipes, and no recipe plug-ins really accommodate them. You'll have to print the 20th century way -- copy, paste into a word processing-type document, and print. A pain, and we're sorry for that, but if you want to print, that's the easiest way. Or just use your phone or chromebook in the kitchen -- that's what we do, and that's the 21st century way. :-) Thanks for reading and taking time to ask the question. Hi Jean, you'll love this! Really good. :-) Thanks for the comment. John, this recalls a country version of this I had as a youngster. It used bacon grease instead of butter and iceberg lettuce instead of bib. I like your gourmetized version and must give it a try. Hi Ron, we do the bacon version, too. That's particularly nice with spinach! Thanks for the comment. Hi John, what an amazing butter sauce for the salad...looks delicious with a hint of garlic...I can only imagine the flavor of this sauce. Thanks for sharing the recipe. I hope you are having a great week! Hi Juliana, this is such a nice dish -- SO flavorful! Thanks for the comment. Oh, how we miss Gourmet Magazine. Sigh. Thank you for bringing this recipe back. I never have had it but will soon, for sure! Butter is, after all, a food group. Hi David, butter is definitely a food group! At least around our house. :-) Thanks for the comment. What an interesting and intriguing salad! Hi Valentina, Happy Birthday to your husband! And enjoy this -- it's really good. :-) Thanks for the comment. Hi Amy, isn't this fun? Kinda different. :-) Thanks for the comment. How have I gotten this far in life without ever hearing that you could put butter on lettuce! AAAArgggg! It sounds amazing. Hi Amalia, butter on bread would be the traditional way of deploying it. :-) Thanks for the comment. Hi Jeff, it IS amazing. You need to make this -- you have lots of lost time to make up. :-) Thanks for the comment. Bibb/Butter Lettuce = MY FAVORITE!! Seriously my favorite over ALL OVER lettuce/leafy greens! So this - THIS RIGHT HERE is a salad I would loveeeee! Hi GiGi, butter lettuce is really good, isn't it? :-) Thanks for the comment. It was delicious! A bit pressed for time, I used my Kerrygold garlic-herb butter which I'm guessing might be similar to adding the garlic. I also tossed everything together as it was a buffet, though I was tempted to plate each one as you did. Everyone loved it! Love trying new things in the kitchen. Thanks for the inspiration. Such a simple yet cozy and delicious looking salad! Hi Denis, it's an excellent dish! :-) Thanks for the comment. Don't you love it when an old recipe pops up. I happen to have a few Gourmets from the 80's in the bookcase and now you have me wanting to go through them. This recipe is awesome. I can see this being served with homegrown tomatoes and a grilled steak. Hi MJ, homegrown tomatoes and steak! Perfect companions to this salad. :-) Thanks for the comment. This is an interesting recipe. I am a butter lover, so I think this salad is something I would love. I need to try it. Hi Dawn, you really DO need to try this -- it's wonderful! :-) Thanks for the comment. The title for this recipe is certainly a mouthful- butter lettuce topped with butter- a double whammy! I've never heard of Boston Bibb lettuce before- must check it out! Hi Fran, this was a fun title to come up with! Fits the dish, though, no? :-) Thanks for the comment. Hi Anne, this is definitely your kind of dish! And yes, the dressing is amazing. :-) Thanks for the comment. It's funny as I was looking at the photo and thinking; is that actually a recipe? But really interesting with adding the butter to the lettuce. Will definitely be trying that soon! Thanks John! Hi Simone, this barely qualifies as a recipe, I think. But it's really good, and rather unusual. Thanks for the comment. I have never heard of this before, but I have a weakness for butter so I think I would really like it. Hi Emma, this is a wonderful recipe -- tons of flavor. :-) Thanks for the comment.